My living room rug has seen better days. I don’t know what I was thinking when we bought a white rug! Well, actually, what I was thinking is that at the time we were living in a wood paneled box and I needed something to lighten things up. I didn’t think it would be all that hard to keep clean. It wasn’t really the children… their messes pretty much came out with a cleaner. That culprit for that huge brown stain is coffee! It wouldn’t come up for anything! Anyway, I was tired of looking at the dingy mess and decided that the less white space the better. 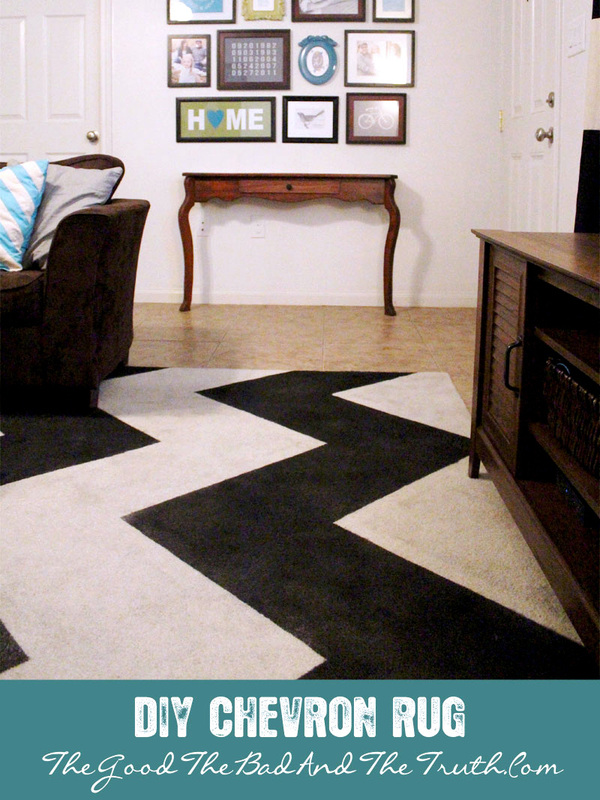 I searched for rug makeovers on Pinterest and found quite a few painted rug tutorials, but they were all for those flat jute rugs. I was scared to just straight up paint my rug with regular paint. That’s when I came across Simply Spray Fabric Paint For Upholstery! It’s specifically for upholstery and dries soft. Their website says it can be used on sofas, chairs, pillows, carpets, curtains, lampshades, linens as well as car, boat and RV interior. I got two 8 ounce cans in Midnight Black (the only color they had at the time) and began to muster up the courage to actually paint my rug. I waited about 5 months… haha. 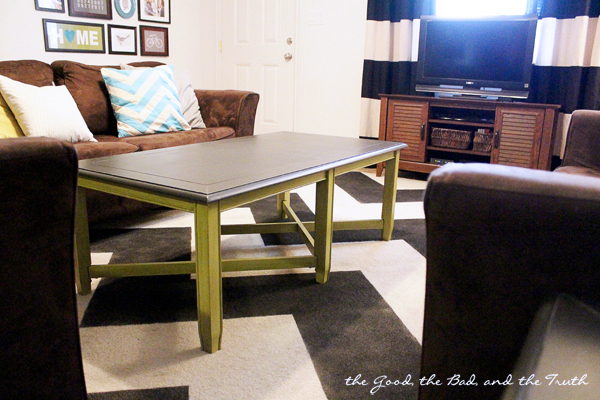 Painting your rug is a big deal and I couldn’t find anyone else who had done it! First step was to clear and vacuum the rug. Next I used duct tape to mark my design. 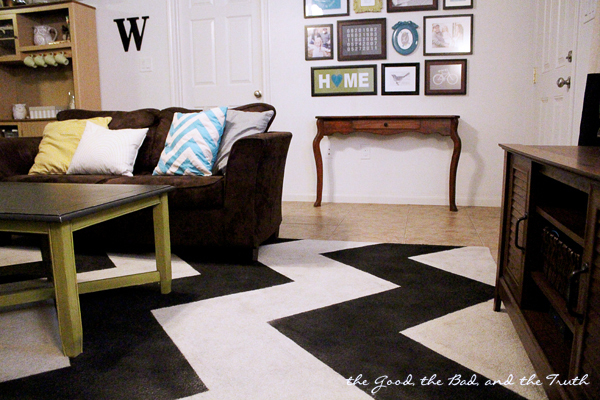 I chose a chevron stripe, of course! 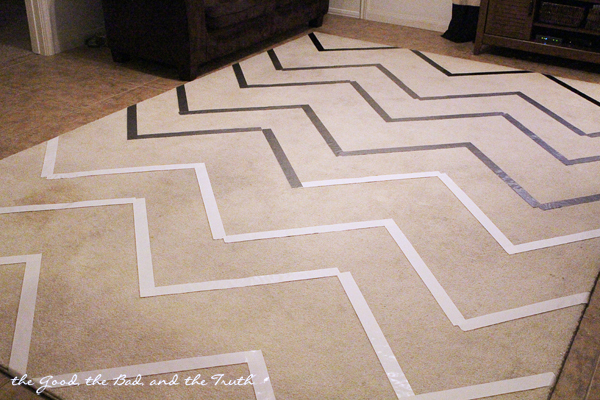 I was concerned that the paint might seep underneath the tape because it didn’t stick to the carpet very well, but I am really happy with how clean the lines turned out! Then I used paper to cover the areas that I didn’t want painted. This is where some advice would have been helpful! The overspray seeped through some of the paper, but I was able to clean most of it up with a spray rug cleaner before the paint dried. I would recommend several layers of paper or something more sturdy like poster board. Before the paint dried, I pulled up all the paper and tape. Be careful that the paint on the tape doesn’t drip when you pull it up! If you attempt this you will see what I mean! I’m pretty happy with it! I could have used another can of paint because it is a little splotchy, but I don’t really mind. I like the rustic-ness it adds. 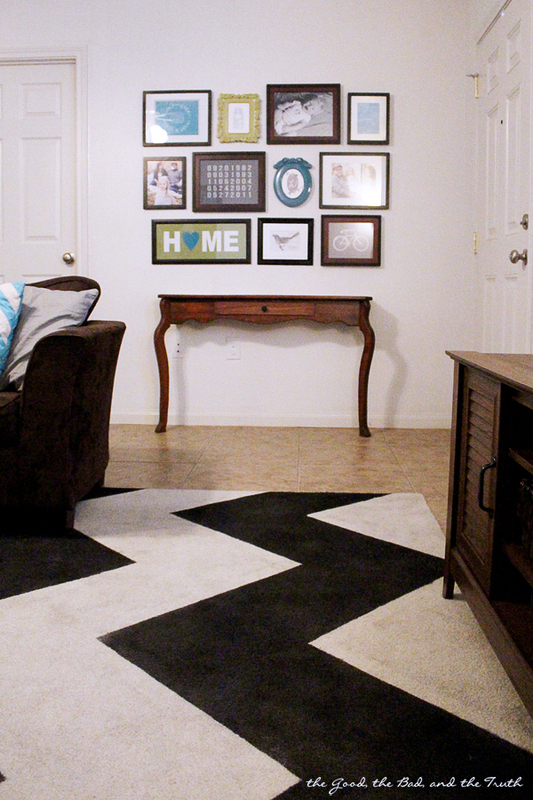 Just know that if you want a solid, completely saturated design, you will need at least 3 cans for an 8×12 rug. 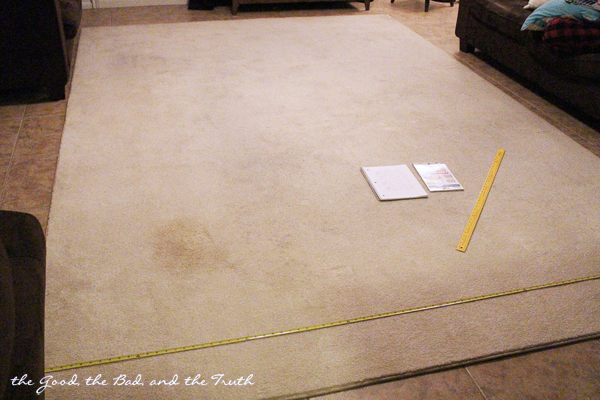 If you look closely at the photo below you can see that overspray that seeped through the paper at the edge of the rug. It’s faint, but there. All in all, I’m pretty happy with it! I’m kind of thinking of getting a light color to paint over the white parts. What do you think? I love love love this idea! I found that I can buy that spray fabric paint at my local fabric store… but all the reviews were horrible! Did you have a problem with clogging nozzles? That seems to be what everyone’s problem was,… clogging nozzles and the spray not lasting long enough to finish even one tote bag. You wrote that you used three bottles for a 8×12 rug, so it sounds like the can lasted plenty long enough for you! Thanks for any insight! The rug looks great! 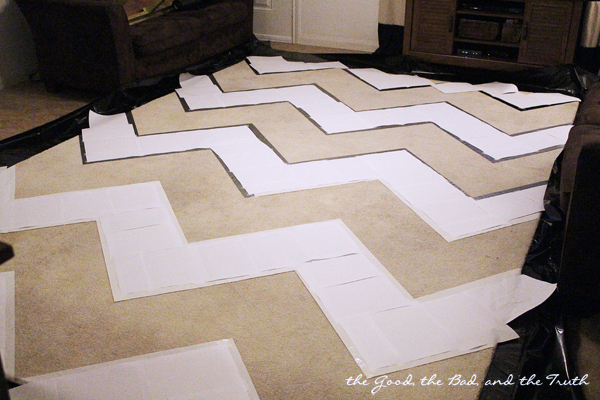 I plan on creating my own Chevron rug to in my living room. Thank you so much! This was definitely helpful! I like your rug and I like your style. Nice job! Pingback: 29 Smart Spray Paint Ideas That Will Save You Money Swifly - Homesthetics - Inspiring ideas for your home. I have a traditional rug that has dark colors like red, black, orange and green. 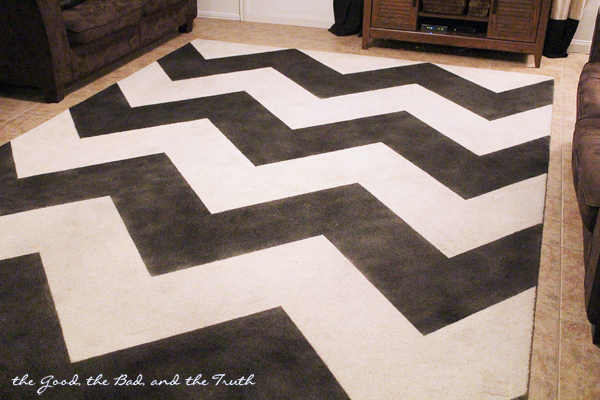 I want to paint it like the colors in your rug white and black with the chevron pattern. Can you paint over dark colors with lighter colors? Note: I purchased my rug from Haverty’s several years ago. It’s fairly thick. No, I wouldn’t think so. At least not with the type of paint I used. It’s more like a dye that gets into the fibers instead of just sitting on top. That’s why the rug stays fairly soft. 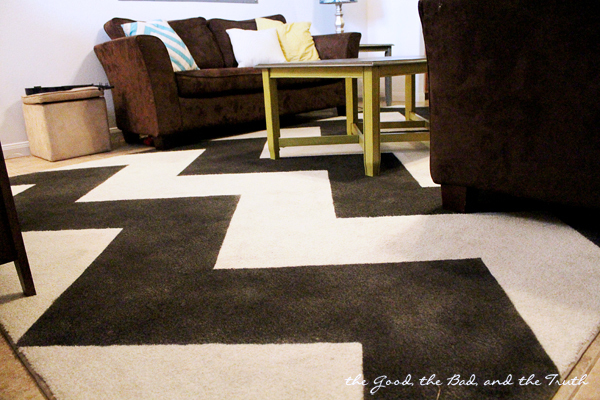 Any thick or light color paint designed to cover up darker colors would probably leave the rug with a hard finish. I read your story about the coffee stain out loud to my husband. Your carpet is identical to ours and one morning at 5:30 as he was heading to work, he appeared beside me to wake me up to say he spilled a coffee on the carpet. I tried everything but there is still the faint stain. Your carpet turned out beautiful. Hi! I know this is a very old post, but I’m considering doing this with one of my rugs. I’m glad I found this post. I’m wondering how your rug held up over time? Did the paint look good for a while? Thx! I’m a stay at home mom that used to get tattoos and tour the country playing bass in a rock band. Most of the music gear is sold but I still have the tattoos. These days you’ll find me spending time with my family, working as a freelance graphic designer, or writing. You’re welcome to link to TashaWiginton.com or use a single image with a brief description to link back to any post. Republishing posts in their entirety is prohibited. Feel free to pin on Pinterest! Tasha Wiginton is a participant in the Amazon Services LLC Associates Program, an affiliate advertising program designed to provide a means for sites to earn advertising fees by advertising and linking to Amazon.com. A stay at home mom that used to get tattoos and tour the country playing bass in a rock band. Most of the music gear is sold but I still have the tattoos. These days you’ll find me spending time with my family, working as a freelance graphic designer, or writing.